The term wellness has been around for decades. The definition has changed slightly from one generation to the next, but the concept remains the same. The principals of wellness are based on the care and maintenance of one's own health by following the examples of nature and natural law. Today we have become more and more dependant on technology and pharmacology for our healthcare. This dependence has without question helped us overcome acute illness and led to amazing breakthroughs in life saving procedures. Unfortunately, we have traded acute illness for chronic illness. The evidence is all around us. Today we have more heart disease, cancer, obesity and diabetes than ever before. These are all considered illnesses of lifestyle, created by poor choices in what we eat, how we move, and how we think. 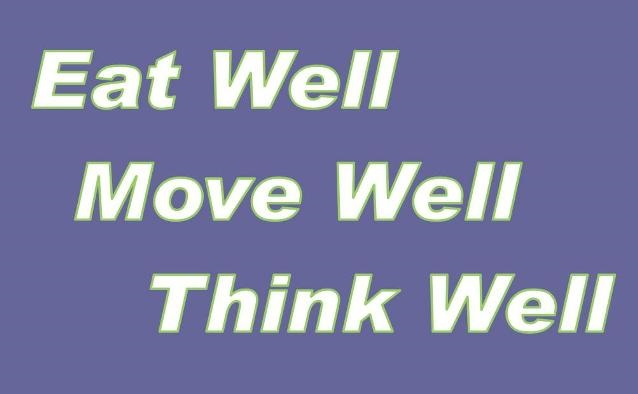 In the chiropractic definition of wellness, we focus on three very important lifestyle practices; eating well, moving well, and thinking well. By following these three basic principals, it is possible to take responsibility of our own health which leads to a longer, happier, life. Why is my Chiropractor interested in wellness? Chiropractors have historically been the leaders in Wellness Healthcare. Since the discovery of Chiropractic in 1895, our principals have been rooted in the concepts of natural healing and wellness. The founder of Chiropractic, D.D. Palmer, wrote the first book on Chiropractic in 1910. In it he described the concepts of wellness and vitalism, which are still considered relevant today. He discussed the importance of daily exercise, eating a balanced diet, and positive mental attitude. Chiropractors have always known that the human body needs no extra help, it just needs no interference. That’s why the removal of nerve interference using a gentle chiropractic adjustment, along with the practice of a wellness lifestyle, is so beneficial to overall health and happiness. What’s the best way to live a wellness lifestyle? 1. What does my body require for normal function and overall good health? 2. What am I toxic to or deficient in that may be driving my body away from normal function and overall good health? Ultimately it comes down to choices we make every day. We can choose to eat, move, and think well providing purity and sufficiency in our every day lives. Or we can choose to eat, move, and think poorly and live with toxicity and deficiency. Which choice do you think fits into the wellness lifestyle? Which choice will lead to health, happiness, and vitality? What are the Basic Principles of the Wellness Lifestyle? 1. Understand that daily physical activity is a required nutrient, not a therapy or an option. 2. Love yourself and take care of yourself; you are too precious to do anything else. 3. Start each day with physical exercise such as stretching and balance training. 4. Add as much activity to your normal daily routine as possible. Walk instead of drive when possible. Take the stairs instead of an elevator. Choose active social outings with the family. 5. Get a workout partner or group for support and encouragement. 1. Practice gratuity or thankfulness every day. 2. Wake up and think about what you are thankful for, go to sleep and think about what you are thankful for. 3. Remember that the LAW OF ATTRACTION binds the universe. We attract the things we are thinking and talking about. If we think and talk about positive things we attract positive things. 4. Practice positive self talk. We have complete control of our conscious self-talk and we can make it positive or negative. It’s our choice. 5. Write down your life goals. Where do you want to be in 1 year, in 10 years, and in 30 years? Make your goals as specific as you possibly can. Exactly how much $ you want to earn, exactly who you want to be married to, exactly what your house will look like…. 1. EAT A FRESH FRUIT OR VEGETABLE WITH EVERY MEAL! 3. Start your lifestyle change by simply adding good things first. Never take the bad things away first. 4. DRINK WATER ALL DAY, EVERY DAY! 5. Have two vices you can splurge on periodically when you have the urge, without guilt. 6. Work towards eliminating all WHITE foods. White Flour, White Sugar, White Salt, and White Milk. This 20 minute workout is designed to target the spine and core muscles supporting the lower back and pelvis. It begins with a short warm-up to increase blood flow in the muscles and ready the joints for more vigorous exercise. Following the warm-up are 7 fundamental Pilates exercises designed to target the core muscles in the stomach and lower back. The workout concludes with a series of slow, easy spinal stretches and a relaxing belly breathing exercise. As with all exercise, please proceed at your personal comfort level. If you experience pain while you are performing these exercises, stop and consult the doctor. There may be a way to modify a specific exercise to make it more tolerable. The goal is to fit this into your EVERY DAY lifestyle. This workout can be done any time of the day, in your own home or just about anywhere. Have fun! Starting Position: Sit up tall with your feet straight out in front or you. Pull your stomach in to your spine. Extend your arms directly out to the sides, keeping them even with your shoulders, so that there is one long line from finger tip to finger tip. Action: Twist from the waist, not from the shoulders. The upper body, including the head, moves as one piece. The pelvis stays stable and does not twist at all. Repeat 3 times. Starting Position: Stand straight and tall. Reach high over your head. Action: Bend forward at the waist toward your toes. Return to first position. Repeat 3 times. Starting Position: Stand straight and tall with arms overhead. Action: Lean to one side and then the other. Return to first position. Repeat 3 times. Starting Position: Sitting or standing with shoulders pulled back and spine tall. Action: Make small circles with the shoulders backwards five times and forwards five times. Action: Bend head forward, backward, side to side, and turning left and right. Hold each position for 5 seconds. Starting Position: On your hands and knees. Action: First arch your spine up as high as you can while tucking your chin into your chest. Second relax your spine and let your belly drop to the floor. Imagine a string pulling your belly button to the floor. Repeat each position 3 times. Starting Position: Stand with shoulders pulled back and spine tall. Action: Walk in place raising your knee high and touching it with the opposite hand. Do this for 20-30 seconds. Starting Position: Lay on your back. Draw your navel towards your spine. Pull your shoulders down your spine. Raise your arms off the floor slightly. Lift your feet off the floor with your knees bent directly above your hips forming two 90-degree angles. Curl your upper body as you gently lift your head off the floor and bring your chin towards your chest. Action: Follow a breathing pattern of five counts as you breathe in and five counts as you breathe out. Tap the floor with both hands with every count. Try to do each inhale and exhale series 10 times in a row. Starting Position: Lie flat on the floor with your knees bent and feet flat on the floor. Curl your body and raise your head off the floor. Action: Bring one foot off the floor and bring it towards you. Lightly grasp your knee with both hands. Repeat this move with the other leg. Always inhale as you lift your leg and exhale as you lower it. Advanced Action: Add another component to this exercise by extending the opposite leg away from you as you bring your knee towards you. Keep your toes pointed and stretch the straight leg as far as you can. Control the movement with the abdomen and don’t let your hips twist. Perform 10 times on each side. Starting Position: Sit upright with your feet flat on the floor and knees bent. Hold the back of your thighs with your elbows bent out. Slide your shoulder blades down your spine. Action: Inhale and tilt your pelvis to create a c-shape spine. Keeping your feet flat on the floor, roll down bone by bone, one vertebrae at a time. Rely on your stomach muscles to stabilize the movement. Exhale and contract the stomach muscles to roll back up to the starting position. Perform 10 times. Advanced Action: Perform the roll up with your arms out in front of you instead of holding onto your thighs. Starting Position: Lie on your side with your knees bent and in line with your hips forming two 90-degree angles. Place your hands on your head, directly opposite each other. Action: Exhale as you lift your upper body off the floor and inhale as you lower it back to the starting position. Don’t jerk your neck or grip too hard with your hands. Perform 10 times on each side. Starting Position: Lie on your back with arms extended out at your sides, knees bent, and feet flat on the floor. Lift your bent legs to form a right angle with your torso. Action: Keeping both legs together and both your shoulders pressing into the floor, exhale as you twist and drop your legs to the left until they're halfway or nearly touching the floor. Inhale and bring your knees back to center and twist and drop them to the right side without bringing them to the floor. Return to center. Perform 10 times. Starting Position: Lie face down on a mat resting on your forearms, palms flat on the floor. Action: Push off the floor, raising up onto toes and resting on the elbows. Keep your back flat, in a straight line from head to heels. Squeeze your stomach muscles against your spine to prevent your rear end from sticking up in the air. Hold for 20 to 60 seconds. Starting Position: Lie on your stomach. Stretch your arms over your head. Stretch your legs out with your toes pointed. Draw in your stomach muscles towards your spine. Action: Exhale and lift one leg and the opposite arm off the floor. Raise your head and shoulder with the motion. Remember to lengthen the leg and arm as you raise them. Keep your hip in contact with the floor. Always keep the stomach muscles pulled up to the spine. Repeat this motion with the opposite leg and arm. Inhale as you lower the arm and leg; exhale as you raise them. Perform 10 times on each side. Starting Position: Standing or sitting with one leg stretched straight out in front of you and the toe pointed up in the air. Action: Reach down and try to pull the toe toward you. Starting Position: Sitting tall with one leg crossed over the other. Action: Bend forward at the waist as far as comfortable. Try to stretch your chin out as far over your knees as possible. Starting Position: Place one bent knee on a chair/bed/bench. Take a big step forward with the other leg. Action: Lean forward until you feel a stretch in the front of the leg on the chair. Arch your spine backwards to get more stretch. Starting Position: Sitting on one hand. Action: Bring other hand over head and gently pull your head away from the hand you are sitting on. Starting Position: Sitting or standing tall with the chin tucked in so the head is over the shoulders. Action: Stretch both arms behind back and try to clasp hands together. Allow shoulders to pull back as far as possible. 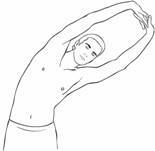 Action: Bend both arms up by sides, forming “L” shapes. Squeeze shoulder blades back together. Imagine holding a one hundred dollar bill between your shoulder blades. Starting Position: Sitting tall with both feet flat on the floor and arms in lap and your eyes closed. Action: Inhale through your nose while concentrating on moving your belly out. Exhale through your mouth while your belly returns to normal position. Do this 7-10 times slowly and deeply. It may help to place your hands on your abdomen while performing this exercise to help you concentrate on moving your belly.